Sun-Ray has been in solar hot water business for more than 30 years. 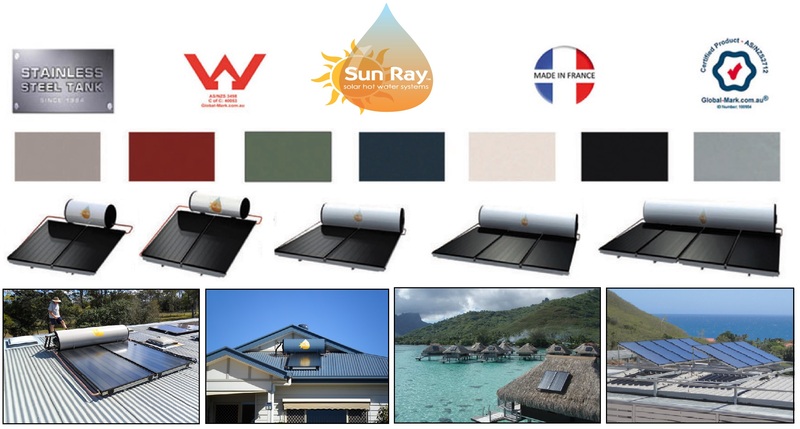 Solar Hot Water Heaters are made in France and manufactured using quality European components. The efficiency and reliability of Sun-Ray’s Solar Water heaters have been tested and approved by independent testing labs. Every Solar tank and every Solar Collector are tested before leaving the factory that is why we offer a guarantee for quality with a standard 10 year warranty on all our Roof Mounted Solar Hot Water Heaters and Solar Hot Water Split Systems. Sun Ray™ : Totally dedicated to Solar Hot Water, Its all we do ! Unlike many other Solar Hot Water Systems suppliers, Sun-Ray is solely dedicated to the development, manufacture and sale of high quality Stainless Steel Solar Hot Water Heater. Sun-Ray always believe that true Solar Hot Water Heater manufacturing is a Specialist Business. One of the great factors to Sun Ray success over the years has been the constant pursuit of innovation. Research and Development is a major part of our business. Every year, we invest 2.5% of our turnover in software, mesurement device, infrastructure, modeling machine, advanced technologies to bettering and developing new products and improving constantly our current product range to provide the best solution in solar hot water for our valued customers. Through international recruitment, we have built a strong team committed to bringing you the best in solar water heaters in term of effeciency. However, due to the location of our research & development centre, which is based in Noumea, New Caledonia (France), we test also every day Tanks and Solar Collector exposed to tropical and cyclone onsite. It is the reason why our system is so solid and durable with a extra long life cycle, with a cyclone and coastal environments resistance particularly in island. During the last 4 years, we have created more than 5 new products with the same philosophy to overseas market like Australia, USA or Europe. It is the most common result of an R&D department to create new products to meet new customer needs, but without a good price you never touch your customer. So it is the reason why sun Ray R&D investigate too in improvement of manufacturing by a constant re-engeeniring product process plus a quality management under ISO 9001-2008 and a strong monitoring system to catch every waste of time or money to obtain the lowest production cost. Sun Ray has selected years after years major suppliers with an international expetise. They provide to Sun Ray the best service and raw materials to produce our Solar Water Heater and Solar Collector every day. Most of them are europeans or australians with a long term history with a ISO 9001-2008 quality management and armed with a strong research and development department too. With these king of partnerships, we are so confident to incorparate our new development on our factory floor for the next customer generation.